A review copy was provided by the author/publisher in exchange for an honest review. All opinions are my own. The only catch? The first part of this novel, made up of the first eight chapters, is its major weakness. I don’t want this to put anyone off though, because it really is not bad. However, when compared to the rest of the book, this section had the feel of a very long drawn-out prologue; the pacing here is a bit choppy, its tone blunt and cut-and-dried, the writing style straightforward and almost pedagogical in its delivery – not unlike a textbook. That’s because the first eight chapters are foremost concerned with establishing background information and historical details. They didn’t quite mesh with the part that came after. To me, Chapter Nine felt more like the real start of the story, kicking off the main narrative which takes place approximately fifteen years after the events of the first section. Here we finally get to the meat of it, when things truly begin to take off. The entire tone of the novel also changes. We get a lot more character-focused, with the plot centered on two key protagonists. Wulfric is a former knight, fallen far from grace, who now wanders the English countryside dressed in rags and chains. Once the greatest soldier and former confidante of King Alfred the Great, Wulfric now lives in the shadows. Fifteen years ago, he fought to rid his kingdom of a plague of monstrous beasts known as abominations, and for his troubles he was cursed with a fate worse than death. Then there’s Indra, a fierce young warrior, determined to prove herself worthy as a knight of the Order, an elite group of monster hunters. She is ten months into her initiation trial, which she must pass to become a full-fledged paladin. To do so, she’ll have to hunt down and kill an abomination within a year. Indra means to succeed, if nothing else just to defy her arrogant and controlling father, who was against this whole idea from the start. She’ll return home with the head of an abomination, or not at all. The difference between the first third of the novel and its later two-thirds is incredible. I was not impressed with the beginning of the story, but after this turning point, I quickly changed my mind. I loved the characters. Wulfric is great, once I got to know him – which I felt we didn’t get the chance to do in the first section. He didn’t become fully realized for me until I got to meet him again in this second life of his, no longer a knight but a lowly beggar keeping away from civilization, fearing that innocents will die as a result of his terrible curse. His painful and blood-soaked past is awful and tragic, and if there’s one thing the intro did well, it was to make readers understand why Wulfric ended up the way he did. I also really liked Indra, which wasn’t too surprising; after all, it’s rare for me to read a spec fic novel and not to be drawn to a female protag, especially one this amazingly skilled with swords. Give me a woman with a sharp blade, any day. The writing style also improved. 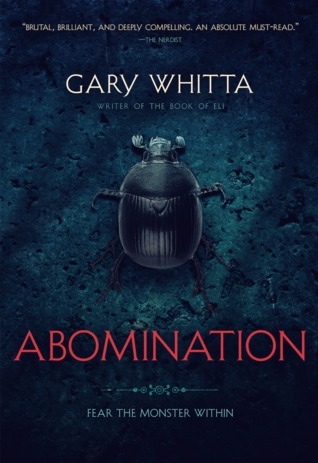 Gary Whitta utilizes a third person omniscient point-of-view all through the novel and the effect is much like watching events play out like a movie. Of course, Whitta is also best known for his accomplishments in the film industry as a screenwriter (he did the post-apocalyptic thriller The Book of Eli and his writing credits also include Rogue One: A Star Wars Story, Star Wars Rebels, and The Walking Dead game from Telltale) so that was consistent with my expectations. I also really enjoyed the main story of Abomination, a bloody and gruesome tale of monsters. I meant what I said about waiting for a book like this to come along; I rarely get to see such a cool mix of history and horror, serious but also entertaining, and absolutely not shy about the graphic violence and grotesque descriptions of the abominations. So if you end up picking up this one and find the writing not to your tastes, please do give it a chance to prove itself. Things really change and pick up after the first section. It was definitely necessary to get the history and background provided by the first eight chapters, but I think somehow weaving all that information subtly and evenly into the rest of the story would have made it a stronger novel. That also would have made a major plot reveal later on much less predictable. Still, aside the awkwardness of the first hundred pages or so, this book is scarily close to perfect. All things considered, I still really enjoyed Abomination and think it’s a damn good book. Worth checking out if you’re a fan of horror – especially if monster movies or stories are your thing! I almost requested this on Edelweiss (?) but my plate was just too full. It sounds like my kind of book for sure. I do always hesitate with small publishers that I’m unfamiliar with, which could account for that very slow beginning you were talking about. Nonetheless, I’m adding this one to the pile! I haven’t read a good monster story a long time! The fact the monsters are called “abominations” too, has my mind turning with what they could look like and do. With that beetle on the cover and the “fear the monster within” line – I thought of those beetles from The Mummy that would crawl under people’s skin. Your warning about the not-so-compelling beginning is more than priceless: this story looks indeed compelling, but I know that faced with a less than flowing start in a book, I tend to abandon it. Now that I’m forewarned (thank you!!!) I will “soldier on”, once I start it, knowing the good parts are just there waiting to be discovered. Yes, I think that’s what a lot of reviewers meant when they said they thought the beginning of the book was more “telling than showing” – I agree, though yes, after chapter 8 it all changes so I’m glad I gave it a chance! I wish I read more horror, this year there weren’t too many on my wishlist though. This one was a nice surprise. The blurb is very vague because it doesn’t reveal very much. It didn’t sound very interesting to me either, but I was glad the publicist convinced me with her enthusiasm. It make me more open to trying this because I don’t think I would have by myself, based on the description alone either. I think this sounds good. I’m not too worried about a slow start in fact I’m pretty patient in that respect, I’ll usually give a book about 50% at least to grab me. I like the sound of horror and history too. Glad to be warned about the first eight chapters, because I would have probably stopped reading it. I am no fan of the cover either. Yeah, it’s not the best cover, though I admit the simplicity of it keeps the unsuspecting reader guessing!